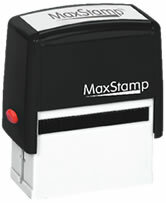 Fully Customized SI-10 Self-Inking Rubber Stamp For You! Anything you want can be made into a rubber stamp. From personal return addresses or business needs to decorating your mail. Custom-made, self-inking rubber stamp model SI-10. Font size may be downsized to accomodate your text if over suggested count. The Model SI-10 Self-Inking Rubber Stamp is very neat. It is ..